Christened by Martha Stewart in 2006, and fully refurbished in April 2018, the Crown Princess has won multiple awards, including Fodor's 'Best Large Ship'. With the capacity of 3080 guests and 1200 crew the Crown Princess is an astonishing sight. The ship's 15 decks hold a whole array of entertainment, dining and activity options to suit all palates. Accommodation ranges from value-for-money Inside and Outside Cabins, spacious and airy Balcony Cabins to luxurious Mini-Suites and large family Suites. The numerous dining options and Princess' own 'Anytime Dining' will make your cruise holiday into an amazing gourmet experience. Enjoy an authentic taste of Italy at 'Sabatini's' or indulge in a mixed steamer pot of snow crab, jumbo shrimp, clams and mussels at the 'Crab Shack' - you will not be disappointed. Sea days are never boring on board the Crown Princess, there is something happening around every corner. Original musicals, magic shows, first-run Hollywood blockbusters, fascinating lectures and various sports competitions will keep you occupied from dusk until dawn. 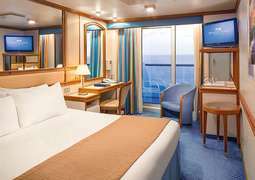 Many different cabin categories are available to the 3080 passengers on board the Crown Princess, including an entire deck of Mini-Suites. About 80% of all Outside Cabins have a private balcony, promising a wonderful stay and an even better view. 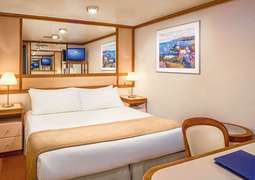 The ship was fully refurbished in 2018, careful attention was paid to the elegant design of all cabins. All Suites and the majority of public spaces are wheelchair accessible. Great culinary variety awaits on board the Crown Princess. In addition to the unprecedented range of inclusive dining there are also specialty restaurants - all ready to pamper your palate: 'Sabatini's' is home to authentic Italian dishes and the 'Crown Grill' is known for its delicious steaks and seafood. 24 hour cabin service is also available to keep you satisfied around the clock and the numerous lounges and bars only add to the variety. The Crown Princess’ multifaceted entertainment programme provides fun and excitement for all ages. Adults are welcome to relax in the Sanctuary Deck area while the younger guests will have a great time in the supervised children’s and teens’ centres. Guests looking for an afternoon shopping spree will love the shopping area with lots of street cafés and a wonderful ambiance. Weddings officiated by the ship’s captain are possible in the Wedding Chapel. The Crown Princess offers destination lectures, art exhibitions and classes taught by local experts. Evening entertainment takes place in the show lounges, the Theater and the open-air cinema - “Movies Under the Stars”. The onboard Casino is one of the biggest you’ll find on the high seas. The ship's special highlight is the 'Skywalkers Nightclub' and observation lounge, it floats 150 meters above water. A golf course, three golf simulators, game courts, an athletic track, and the 'Lotus Spa' with state-of-the-art Fitness Centre are only a few of the places to keep active on board. The whirlpools and swimming pools are also available to help keep you both refreshed and relaxed. One pool in particular is equipped with a cross current for a more active swim. The dress code on the Crown Princess is generally casual. You’re free to wear whatever makes you feel best. However, the dress code becomes smart-casual once the sun goes down, and elegant and formal clothing is recommended for special occasions. Registered in Bermuda and weighing 113,000 tonnes, the Crown Princess can accommodate 3,080 passengers across her 15 decks. The magnificent cruise ship measures 951 feet in length, and is run by Princess Cruises. The ship has 1,201 observant and obliging crew members who are always ready to lend you a hand when you require help. 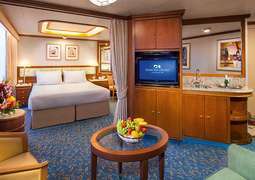 The Crown Princess is similar to the other Princess ships, although unlike the other ships in the fleet, she has an additional set of cabins that can accommodate an additional 500 passengers, since she is slightly bigger. Crown Princess is one of the most astounding vessels that ply the European seas. 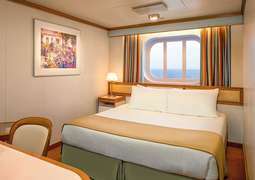 You can book your cruise through CrusieAway.com.au and get to enjoy some of the best offers available in the sector. The magnificent Crown Princess boasts 13 cabin classifications. They vary from a 591 square foot lavish owner’s suite right down to a 160 square foot interior cabin that offers no ocean view due to the lack of windows, and 25 wheelchair-accessible cabins that cater for the physically disabled. The cabins are priced according to their sizes as well as locations, although they all have a TV, refrigerator, hair dryer and shower, while suites have a shower and bathtub combination. Almost 80% of the outer cabins have balconies. The cruise ship Crown Princess offers personal choice dining. This means that clients may opt for either the conventional fixed-time-fixed-table seating arrangement in the Michelangelo Dining Room or anytime dining at the Botticelli and the Da Vinci Dining Rooms. Entertainment and special shows aboard the magnificent ship are performed in the show lounge called the Princess theatre, which features entertainment the Las Vegas way and is performed mainly by the resident cast. The movie screen on the outside near the swimming pool is an amazing 300 square feet and shows first-run movies as well as sporting events, while giving you the feeling of being at a drive-in. The renowned Club Fusion is open at night for people who may wish to dance, and so is the Explorers Lounge, which features dancing, cabaret performances and many other forms of entertainment. There are also quite a number of smaller lounges that play live music for revellers. Don’t waste time! Book your cruise today with CruiseAway and savour the best cruise as you enjoy the best deals in the cruise ship industry! For more information on deals and offer call our cruise experts today on 1300 887 590.